Santi Kusumaningrum, co-director of PUSKAPA is a development specialist with extensive experience on public policy, research and model interventions particularly on protection and well being of children. Her work has been focusing on social protection and access to justice to address vulnerability affecting children and families. 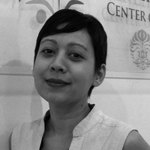 In 2009 she co-founded, and have been directing ever since, PUSKAPA, a CPC Learning Network affiliate organization. Previously, she spent more than 6 years managing policy and justice for children program in UNICEF Indonesia and 6 years before that as an assistant lecturer and researcher at the University of Indonesia’s Department of Criminology. Now she returned to the University to link analytical work with development agenda.